For the past three years at Work-Bench, we’ve been investing in a total reimagining of enterprise technology stack. Understanding the magnitude of this shift, we began tracking and recording every funding round that met our scope of enterprise technology. We compiled these ~1,500 funding enterprise funding rounds into an open source Enterprise Startups Funding Database, with the hope that this dataset could one day lead to a better understanding of the tectonic shift happening in enterprise technology by our community of investors, entrepreneurs, and corporate executives. After averaging $2.2B a quarter in funding during 2014, funding activity has increased 76% over the last 6 quarters, with enterprise startups across the U.S. raising $3.8B a quarter on average. 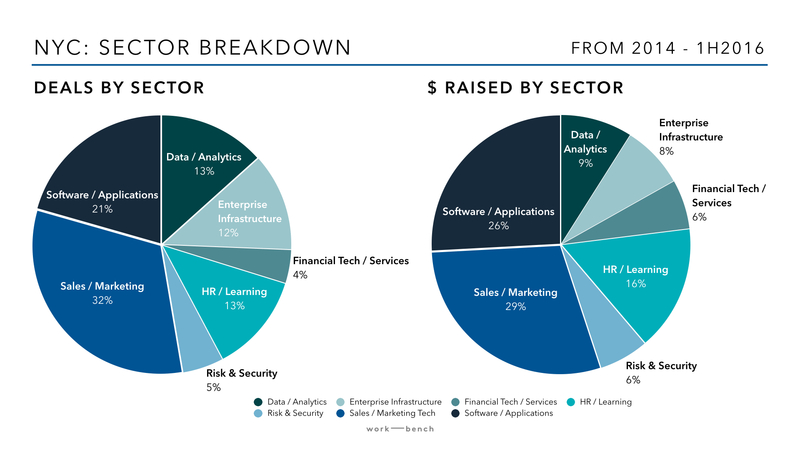 The largest sectors from a dollars raised perspective over the last 3 years have been Software / Applications, Data / Analytics, and Enterprise Infrastructure. Since 2014, New York has been solidly second in command (after California) for enterprise startup financings, in terms of both deal quantity and dollars. 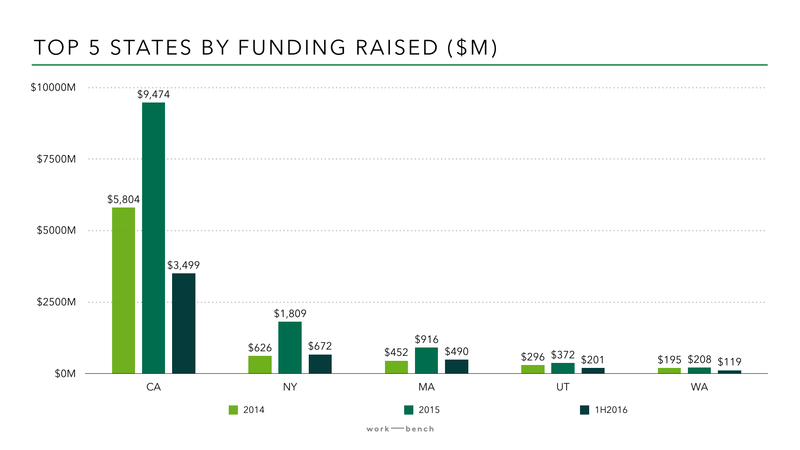 See below for a deep dive on New York’s enterprise startup trends. 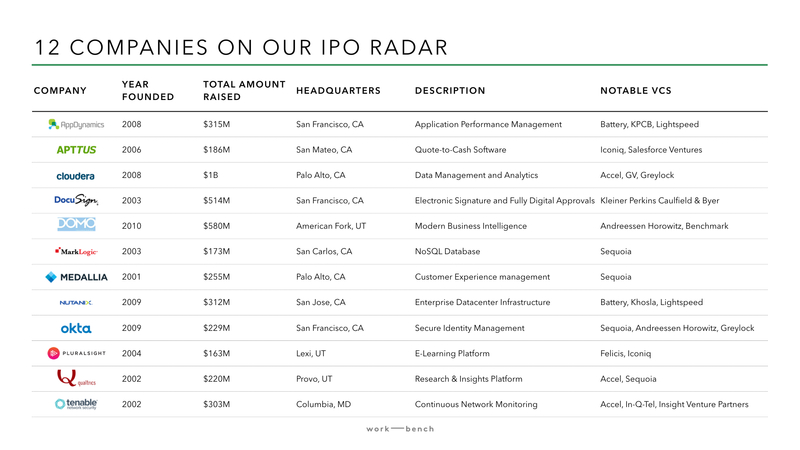 Although there has been a drought of recent IPOs, we’ve seen nearly $40 billion in M&A in the first half of 2016, and there is a robust pipeline of potential IPOs to come. Q1 2016 began with public SaaS companies experiencing a big pullback in trading multiples, which led to startup founders and VCs proclaiming that the sky is falling. This in turn led to ~$1B less in funding raised than Q4 2015. 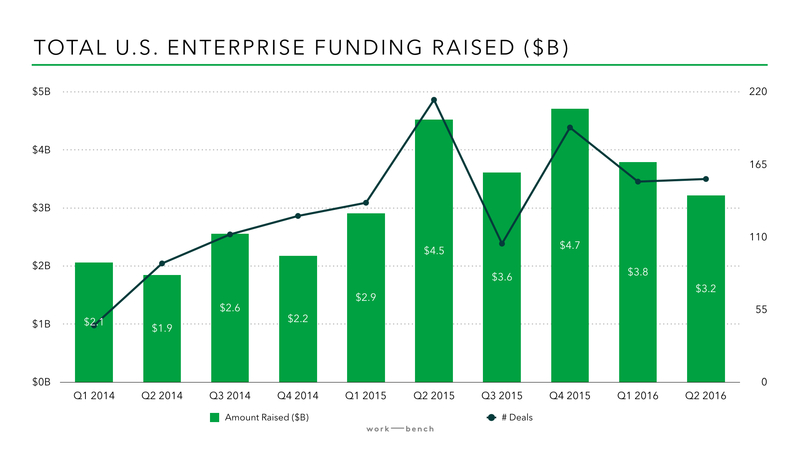 Similarly, Q3 2015 saw ~$1B less in funding raised than Q2 2015, caused by uncertainty in the public markets last summer. 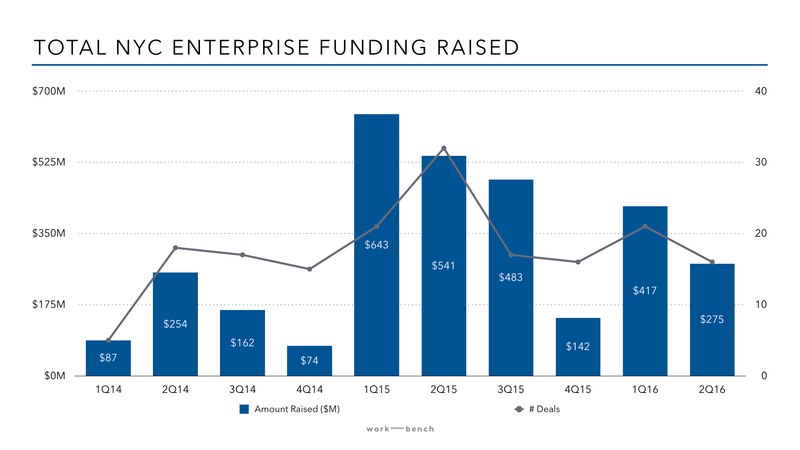 On a positive note, in the first half of 2016, enterprise tech startups have raised $7.0B, which isn’t too far off from $7.4B in the first half of 2015. 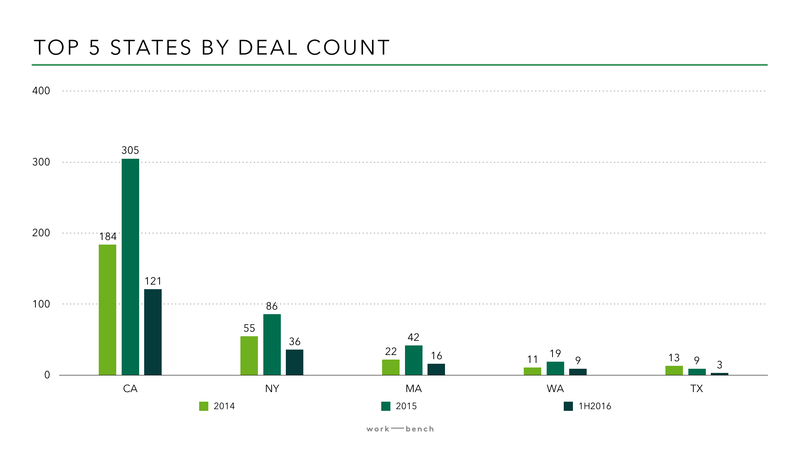 There were 306 deals done in first half of 2016 vs. 350 in first half in 2015. We expect to see a strong second half of the year for fundraising, since many startups who sat out the Q1 2016 craziness and opted to batten down their hatches improved their operating metrics, and can now go out to market in a relatively more positive macro environment for funding. 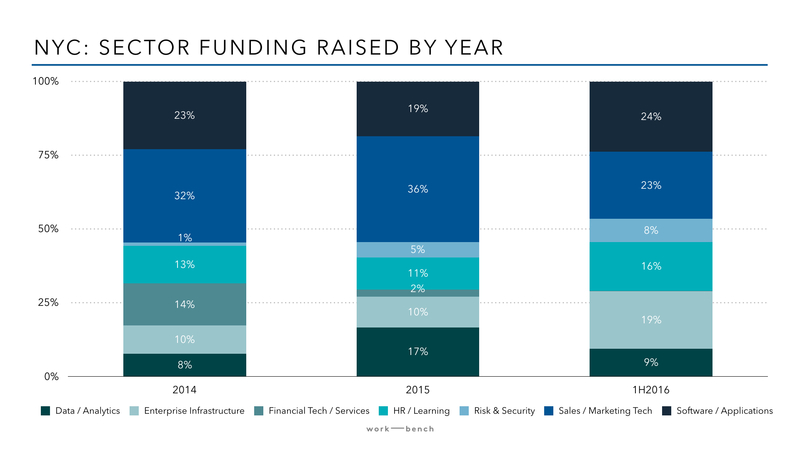 As can be seen from the breakdown of financings by stage, what is interesting is that funding distribution has stayed pretty much consistent from 2014 through the first half of 2016, even as deal count has grown substantially year on year. 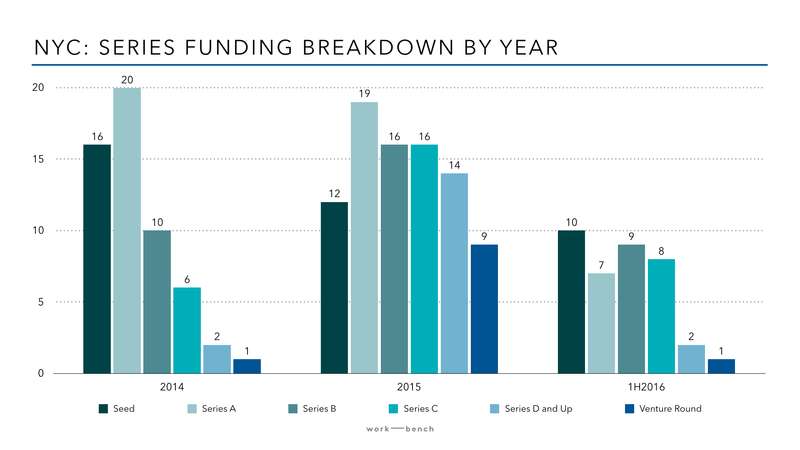 Series A has been steady as the main funding category and represented 31% of all deals in the first half of 2016, followed by Series B raises at 25%. A quick caveat with this data to note is that a lot of seed funding is stealth, making it more difficult to capture the data. For the 10% of companies who raised Series D financings and higher, we need exits! Despite the M&A frenzy so far this year, highly valued unicorns haven’t been asked to prom. We figure that some still need time to grow into their lofty valuations, while others may unfortunately never prove to be that valuable (and will therefore need to exit for less than their last rounds). Unless you’re Uber, continuing to raise late stage capital from private markets is going to be tough. When evaluating the top enterprise sectors that received funding from 2014 through the first half of 2016, there has been a pretty strong consistency across deal count and dollars raised. The top category overall is Software / Applications, which is our catch all for SaaS applications across a variety of sectors, including companies like Slack, InVision, and Sprinklr. It should come as no surprise that next on the list is Data / Analytics companies riding the “Big Data” wave that has recently been focused on machine-learning and artificial intelligence investments. These companies represent 18% of the deals done and have raised 20% of all financing dollars. The third leader varies if you look at deal count or dollars raised – Sales / Marketing applications represented 19% of total deal count but only 13% of capital raised, while Enterprise Infrastructure had fewer deals (12%) but for a bigger piece of the funding pie (18%), which makes sense given the large investments required to scale infrastructure startups. When looking at the annual breakdown of sector splits, things have been pretty consistent year on year, as evidenced by the chart below. It should come as no surprise that California led the pack in number of deals, but it’s great to see the data support the growing New York City enterprise tech scene that we like to tout. Since 2014 New York has been a clear number 2, ahead of Massachusetts (mainly Boston) and Washington state (Seattle). When we looked at cumulative dollars raised from 2014 through the first half of 2016 by state, California was the clear winner with $18.8B raised. New York City was a distant #2 with $3.1B, followed by MA with $1.9B. After that we had Utah (largely propelled by numerous financing rounds for Domo), and then Washington state. It's exciting and it makes us proud to see that New York City's enterpise ecosystem is creating a nice distance between itself and the rest of the pack, and we're just getting started. The aggregate transaction value is $38.9B, with the biggest sum of money coming from Microsoft’s acquisition of LinkedIn for $26B. With the acquisitions of AVG, Demandware, and Marketo as well over the past couple of months, it's become clear that the larger SaaS vendors who have achieved scale are prime acquisition targets. The big wait and see for us in the second half of 2016 is the continued plight of unicorns, many of whom are significantly overvalued relative to revenue, growth, and profitability metrics. With the flight to quality being demonstrated by strategic acquisitions and private equity purchases alike, the question is whether unicorns will grow into their valuations and warrant large outcomes, or if most will have to raise down rounds and/or be taken out for amounts that won’t make late stage investors happy. While M&A picked up in first half of 2016, enterprise technology IPOs were few and far between. There’s a healthy pipeline building up though, and we highlighted 12 favorites to watch over the next 12 months below. 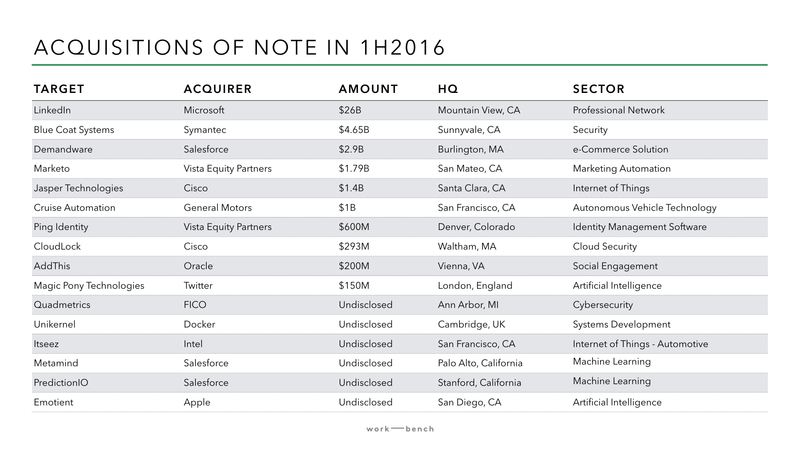 The 3 companies we’re tracking most closely for IPOs this next year are AppDynamics, Cloudera, and Nutanix. AppDynamics - AppDynamics offers application performance management software, and competes with New Relic and older software from the likes of CA Technologies (where founder Jyoti Bansal used to work). With over 1,600 customers, the company is riding the digital transformation wave that is top of mind for all Fortune 1000 companies seeking to ship software faster and be more agile. If revenue growth is continuing at an impressive clip, and if margins improve over time, this will be a nice IPO in the market to demonstrate the prowess and value of infrastructure companies. Cloudera - Cloudera is heralded as the leader in the big data analytics market and disclosed over $100M in fiscal year 2015 revenue, with 70-75% of revenue from software licenses. The market is highly fragmented, and Cloudera faces competition from legacy incumbents like IBM, direct competitors like MapR and Hortonworks, and indirectly from numerous startups. Continued growth for Cloudera and more successful Hadoop use cases in the enterprise will mean better valuations for the broader data and analytics ecosystem, something that all investors are clamoring for. Nutanix - Nutanix delivers an enterprise cloud platform that natively converges compute, virtualization and storage into a resilient, software-defined solution. In English, this means that Nutanix helps Fortune 1000 companies simplify datacenter operations. It’s continued growth has demonstrated one of the biggest shifts prevalent in the datacenter today – out with the proprietary hardware, and in with the specialized software on top of commodity hardware. Since 2014, New York has seen $3.1B flow into various enterprise startups over a total of 178 financings. Like the rest of the country, 2015 was a year of tremendous activity, both in terms of deal volume and dollars raised. While 2016 saw a bit of a pullback, it is still trending well above 2014 levels. 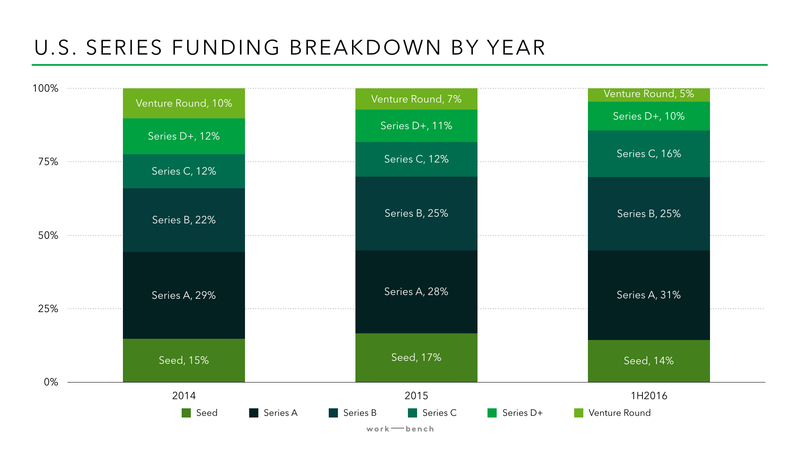 After significant Seed and Series A activity in 2014, funding rounds by stage in 2015 were more evenly distributed. This is a positive indicator, and it bodes well for our continued ecosystem growth because it demonstrates that early stage companies are able to raise subsequent financing to keep maturing. 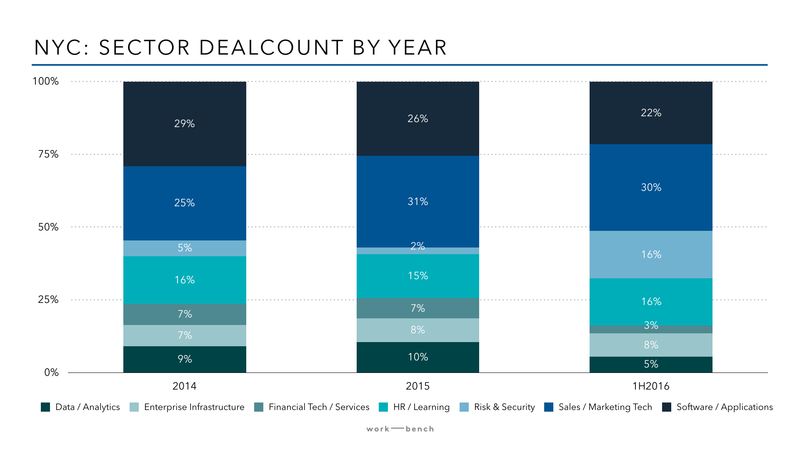 From a sector perspective, Sales / Marketing Tech startups have led the way in gross dollars raised and total number of deals since 2014. This makes sense given our roots in NYC, and is representative of companies like Sprinklr, Appboy, NewsCred, Taboola, Persado, Percolate, Zeta Interactive, and others. The second largest category of NYC enterprise startups since 2014 is Software / Applications, with examples including InVision, VTS, x.ai, Trello, Smartling, Handshake, Work Market, and Rocketrip. 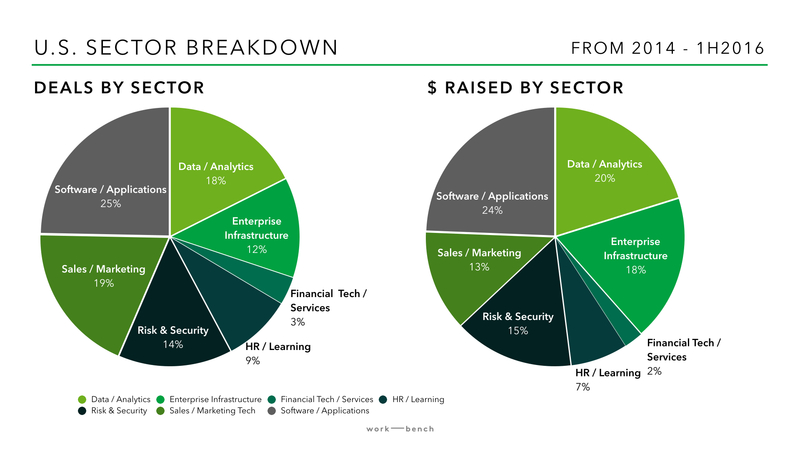 HR / Learning rounds out the top 3 categories, with numerous startups such as Greenhouse, Namely, and Justworks growing extremely rapidly over the last few years. To get a better sense of up and coming sectors, we looked at dealcount and dollars raised year on year by sector. Two sectors growing rapidly in prominence in NYC are Enterprise Infrastructure and Risk & Security. NYC has several maturing infrastructure startups like Datadog, Digital Ocean, Bettercloud, and Apprenda, and they’ve collectively garnered interest from top west coast VCs including Andreessen Horowitz, Accel, Index Ventures, NEA, Amplify Partners, and Ignition Partners. There are also a plethora of up and comers like Cockroach Labs, Backtrace, and NS1, who are well funded to build out their deeply technical products to power the next-generation of Fortune 1000 developers and datacenters. Collectively, Enterprise Infrastructure saw $378M in financing since 2014, with $135M of that coming in first half of 2016 alone ($94.5M for Datadog, $20M for GigaSpaces, and $20.3M for Cockroach Labs). 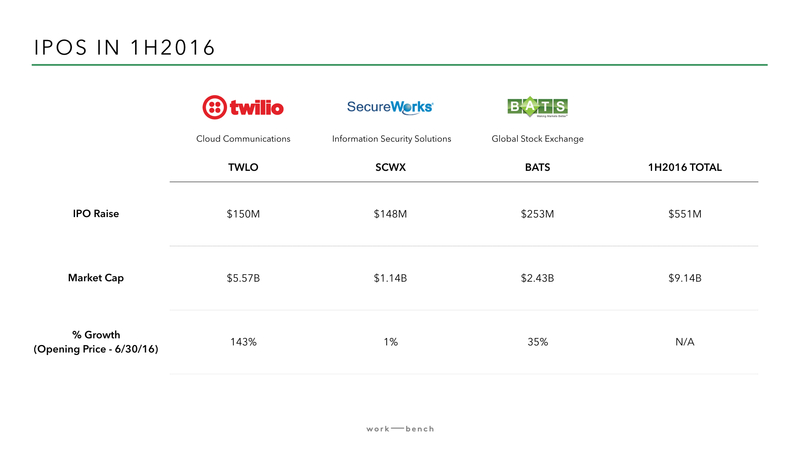 To start the first half of 2016, Risk / Security startups have made the biggest leap from 2014 and 2015 norms, with financings from SecurityScorecard ($20M Series B), Avanan ($15M Series A), Bayshore Networks ($7M Series A), Cynet ($7M Series A), and seed rounds from BigID ($2M) and Siemplify ($4M) leading the way. Be on the lookout for more companies from both of these sectors due to highly technical founders moving to NYC from places like SF, and also leaving local webscale companies like Google, Twitter, Square, Etsy, and Tumblr to start their own enterprise startups targeting Wall St and healthcare companies – the earliest adopters and biggest consumers of infrastructure and security products. There’s plenty of data out there on round sizes and valuations holistically for startups across the country. Given our unique dataset though, we wanted to dive into how Seed through Series C raises in NYC have trended over the last few years in terms of median dollars raised in the rounds. When looking at median Seed round sizes, the first half of 2016 saw an increase to $2.5M seed raises from $1.7M in 2015 and $1.5M in 2014. Meanwhile, if you look at Series A and B data, median amounts raised over the last 3 years have stayed pretty consistent. 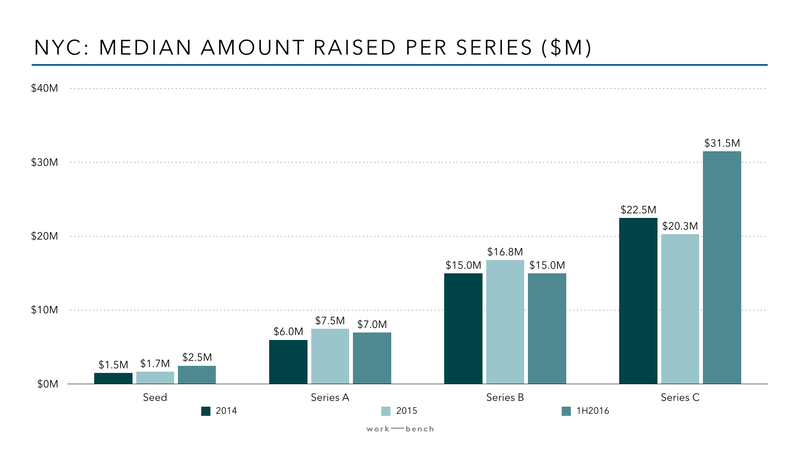 For Series C raises, there was a dip in 2015 that has since increased past 2014 in the 1H16 amounts raised. One of the knocks on NYC tech, and especially our enterprise ecosystem, is that we haven’t had enough exits yet. It’s a fair point, so we’ve decided to start tracking how many growth stage companies we have by their funding raised. Naturally, one can expect that as we get more well funded enterprise startups in NYC, exits should be not too far on the horizon. We'll be sure to keep an eye on our ecosystem, and will continue providing updates. If you enjoyed this post, please give it a share on Twitter and sign up for our Enterprise Weekly newsletter, a weekly digest of all things enterprise with 10K+ subscribers. Jessica is a builder and social engineer on a mission to bring people together to make great things happen. She leads our Work-Bench community, member experience, and enterprise education events.